Tecmo Super Bowl on the Super Nintendo expanded upon the previous entries most notably updating the rosters and adding the Jaguars and the Panthers. I played the game, but not with the same fervor as I did the previous entries- as the Houston Oilers had been gutted due to the salary cap and Bud Adams meddling. The Jags showcased James Stewart as their main back. He was more of a powerback with high hitting power and low speed and provided somewhat of a challenge when he was in excellent condition. James was selected in the first round of the 1995 draft by the Jacksonville Jaguars (19th overall). This draft had a pretty solid lineup of runningback talent headlined by the cursed Ki-Jana Carter. Other notables included Tyrone Wheatley, Napoleon Kaufman, Rashaan Salaam, Sherman Williams, Curtis Martin, and Terrell Davis. Stewart plodded away behind the Jaguars line for 5 seasons. His best year came in 1999 when he put up 931 yards on 249 carries, while rushing for 13 TDs. In 2000, he was allowed to sign as a free agent with the Detroit Lions. The Lions had been looking for a replacement for Barry Sanders since his sudden retirement in 1999. While James was up to the task, it would’ve been impossible to replace the future Hall of Famer. 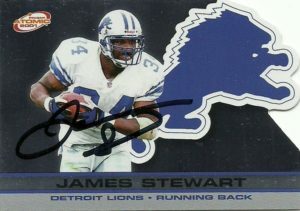 Still, Stewart put together 1184 yards and 10 TDs in 2000, and 1021 yards and 4 TDs in 2002. During the 2003 preseason, James’ shoulder was shattered. Unable to fully recover from the injury he retired at the conclusion of the season.